When I mention that I have traveled to Vietnam, I am acutely aware of still-festering wounds endured by many. Although the “Vietnam War,” as we call it in America, ended before I was old enough to comprehend the intricacies of international politics, I grew up aware of the conflicting rhetoric and high emotion that surrounded the war. I understood that for many, the US war in Vietnam was a tragic altar on which we sacrificed our youth and innocence, and then blamed those ordered to go, those willing to lay down their lives on our country’s behalf. I was born in 1970. The US war in Vietnam fell across my face like a shadow; but, for the most part, it mercifully flitted away. At the time of my birth, my father served proudly in the US Navy. His term ended just two months after his ship, the Midway, was scheduled to sail for Vietnam. Gratefully he accepted an early honorable discharge in order to return to his young wife and me, his newborn daughter. My dad reflected on that time in our country’s history, “The American people were very divided about whether or not we should even be involved in Vietnam. (It was) a difficult time for America, the country was close to chaos.” I never really understood the blaze of passion in his eyes when he talked about the war until I actually went to Vietnam for myself. I also never grasped how close our family came to a very different trajectory. Had he gone to war, would I have grown up a single-orphan? Or perhaps an emotional orphan as he grappled through PTSD, as did so many of the American troops who served in Vietnam? I glimpsed what might have been when I set foot in the War Remnants Museum in Ho Chi Minh City. I fought a flaming urge to flee during the entire visit as I viewed graphic photos, war artifacts, and Communist commentary. I felt overwhelmed with the realization of how close my father came to personally experiencing the abomination of war. The museum was originally opened in 1975 by the government under the name “The House for Displaying War Crimes of American Imperialism and the Puppet Government.” Although it has since undergone renovations due to the normalization of relations between the two countries, including a change of name, I keenly felt the anti-American rhetoric. Photos of war atrocities, with blame clearly allocated to American forces, and even remains of humans affected by Agent Orange, seared my heart. Passing through a courtyard, a group of school kids crowded in a giggling line and overtly gawked at me. I felt awkward and exposed, wondering if they viewed me in the same monstrous categorization as their government portrayed my compatriots. It’s not that I naively believed that Americans did not perpetrate horrific acts during the war. But, I understood as never before, while touring the museum, why war makes people go crazy. I left the museum with my Vietnamese friend and guide, Nghia (name changed). I sat in the vehicle in stunned silence, unable to comprehend this second-hand experience of a nightmare, and also feeling that if the way Americans were portrayed in the museum was truly how the Vietnamese saw me, I wanted to head for the airport immediately. As if reading my mind, Nghia soberly broke the silence. He explained that though the government portrays a certain perspective of what happened, most people in South Vietnam recognize a different story. Like me, Nghia was also born in 1970. But the war for him swelled from an ominous shadow into a long dark night that engulfed his childhood. He vividly recalls a tragic early morning when he was only five-years-old. A friend and his family who lived next door huddled around their camp-stove. Suddenly a rocket shattered and killed the entire family except the boy. 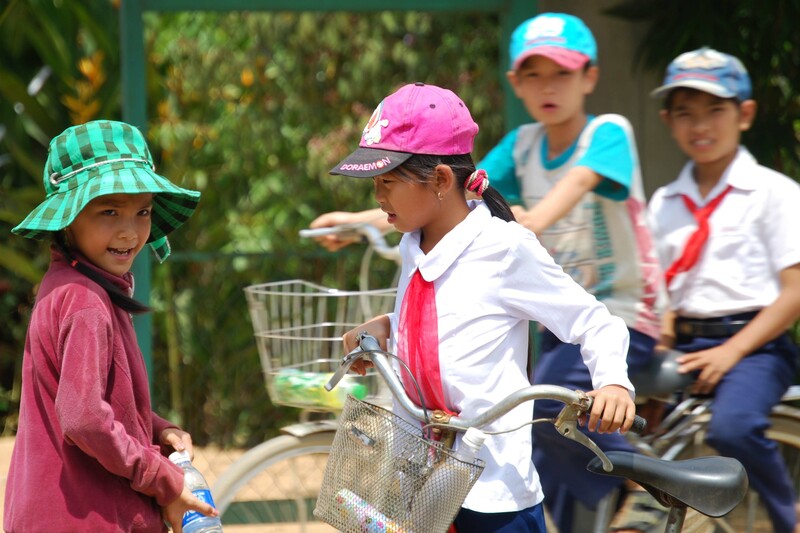 Nghia’s friend was taken in by an uncle, but never recovered emotionally and was too poor to attend school. Nghia longed to help his friend. But his own family evacuated from end-stage battle areas three times in one month, fleeing past the carnage of people who waited too long to leave. 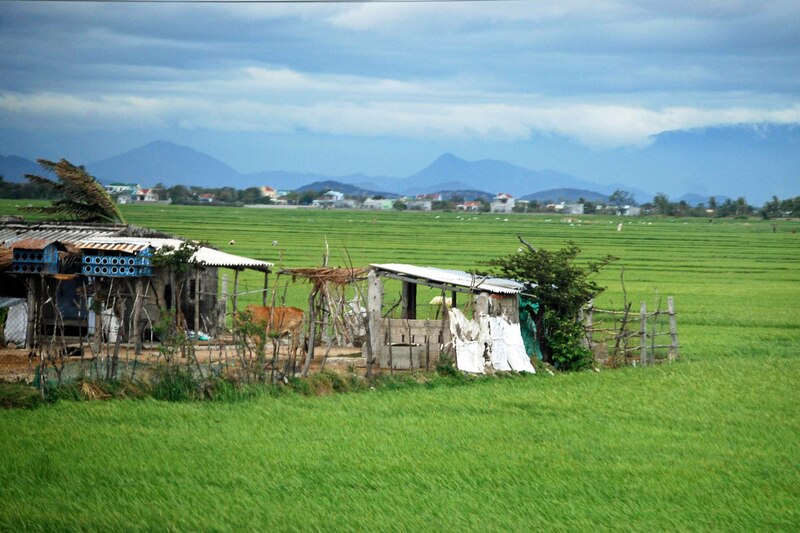 Like many S. Vietnamese, Nghia’s family lost all their property in the war. After Saigon fell, the new Communist government mandated mass relocation of its recently acquired citizens. Cassava and salt kept the family alive, day by day. At the time, Nghia only knew he was hungry. As he grew in his understanding of the world, he realized that loss of freedom was the harshest tragedy for his people. Nghia took me to visit lonely, wind-swept beaches where desperate citizens gambled on the open sea as a better chance for survival than remaining in their homes under the new regime. Poignantly, traveling with me were two friends including a young man of Vietnamese descent. His parents were amongst those who risked ocean waves in small boats and somehow survived. This trip was his first return to his parents’ homeland. Pondering the vast coastline, I tried to comprehend the desperation of these people, crowding into small vessels and pushing out into the surf, fleeing terror larger than the crashing ocean waves. 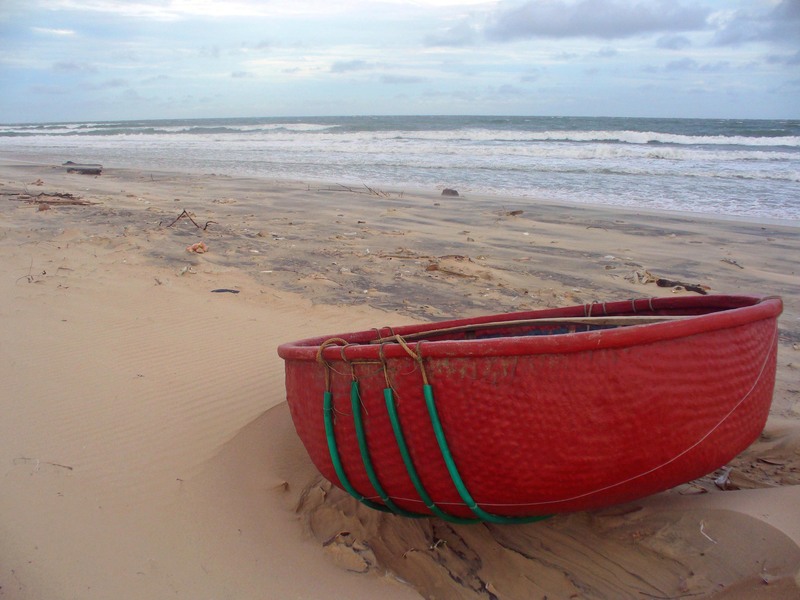 Vietnam beach from which many people fled after the fall of Saigon, (c) Colleen Briggs, 2009 . 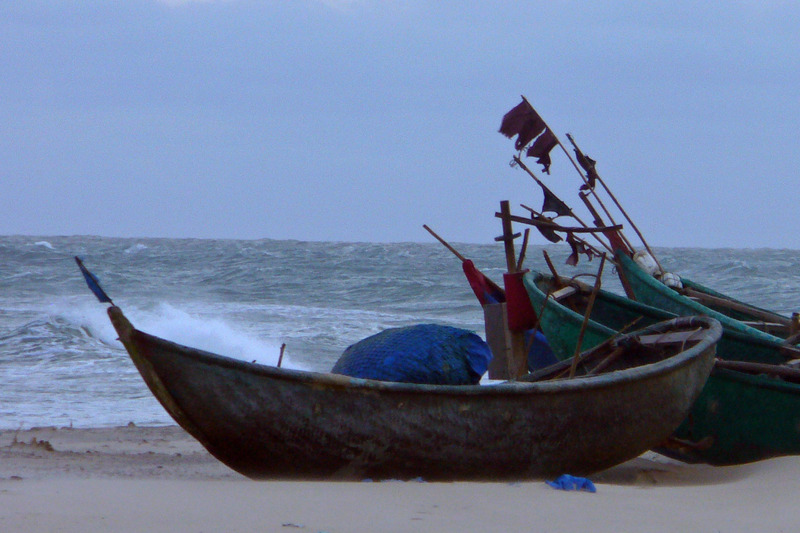 Boats in Vietnam, (c) Colleen Briggs, 2009. Children’s eyes, like Nghia’s, always peer from the dark shadows of adult conflicts.